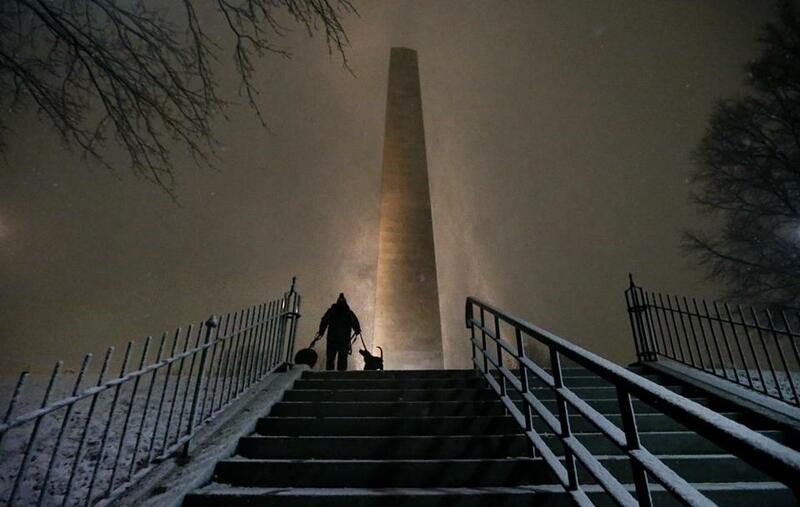 Rudy Hersh took his dogs for their nightly walk as snow swirls around the Bunker Hill Monument during a snowstorm oon Wednesday. A trove of centuries-old documents, recently found archived in dusty boxes at the Massachusetts Institute of Technology and Harvard, shows that the pair of massive nor’easters that pummeled the region’s coast this winter were among the most powerful tidal storms since the 1800s, scientists say. The records put the recent storms in stark historical perspective and heighten the fears of many climate scientists that the severe flooding from the recent storms represents a harbinger of rising sea levels. The documents, which include tide measurements that were made to determine how to build a dry dock for the USS Constitution in the 1820s, extend scientists’ knowledge of Boston Harbor tides by more than a century and show that rising seas are making severe storms worse. In raw numbers, the storms on Jan. 4 and March 2 produced the first- and third-highest sea levels recorded since 1825, the documents indicate. Factoring in rising seas and sinking land levels, the storms rank slightly lower — as the fourth- and eighth-highest storm tides, researchers said. The Boston area has experienced about a foot of sea-level rise since the 1800s, while the land has subsided by about six inches as part of a geological reshaping of the region since glaciers receded from the area after the Ice Age. He worries that the extreme storm surges correspond with the projections that such high tides will become increasingly common as sea rise accelerates. “I think it’s definitely a wake-up call,” he said. Before the research team was able to reconstruct sea levels from the 19th century, and in some cases even earlier, scientists had to rely mainly on tide-gauge measurements that the National Oceanic and Atmospheric Administration has taken since the 1920s. 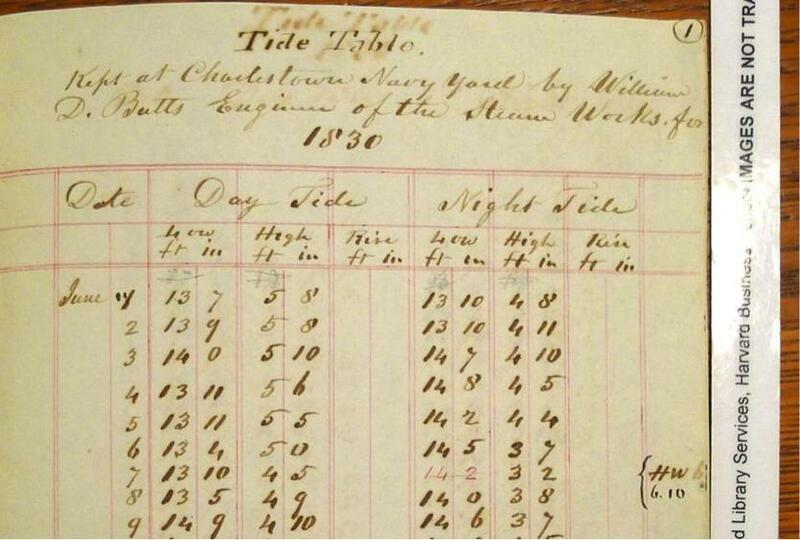 Boston Harbor tide records from the 1800s. The researchers used astronomical data and other sources to corroborate the larger body of records, which mainly came from papers kept by Loammi Baldwin, the chief engineer who built the USS Constitution’s dry dock in Charlestown to survive even the highest storm surges at the time. The three storms that generated slightly greater storm surges before January’s nor’easter occurred in 1851, 1909, and 1978. Records from another storm, in 1723, suggest a similar storm surge, although the information is not easy to corroborate, they said. In each case, as with the latest storms, the surge in tides was the result of a combination of events, including long-term lunar cycles and the alignment of the sun and moon, both of which exert greater gravitational pull and increase tidal ranges, they said. While two storms in 1851 produced high tides that ranked in the top 15, the data compiled by the researchers show how rare it is to have such powerful storm surges occur in such proximity. But it was rising seas that made the latest surges so potent. “The record-breaking event of January 2018 would not have broken the record had it not been for relative sea-level rise that carried the tide and storm surge above the level reached in 1978,” said Andrew Kemp, an assistant professor of earth and ocean sciences at Tufts University who was part of the team of academic researchers who found the records. Without significant cuts in global carbon emissions, seas could rise as much as 10 feet by the end of the century, recent studies predict. That would leave as much as 30 percent of Boston under water. In response, city officials have been working with scientists on ways to defend the city against the threat. Options include relatively inexpensive changes that they’ve already budgeted for — such as installing portable floodwalls in East Boston and elevating low-lying streets in Charlestown — as well as more ambitious and expensive ventures. The city has commissioned studies on the feasibility of building large berms around South Boston and a massive, multibillion-dollar sea barrier in Boston Harbor that could rise some 25 feet over the ocean surface and extend from Hull to Deer Island. A 2016 study by scientists at the University of Massachusetts and other local universities found that consequences of climate change could prove more calamitous to Boston than previous reports have suggested. That study found that sea levels could rise a staggering 37 feet by 2200 — nearly double what had been previously predicted. That projection was based in part on new research that suggests the accelerating melting of the ice sheets covering Antarctica will have a disproportionate impact on cities along the East Coast. As ice melts in the South Pole, the resulting gravitational pull on the ocean, as well as the gradual sinking of land in the Northeast, means that Boston and other nearby communities are likely to experience about a 25 percent higher increase in sea levels than other parts of the planet, researchers found. Climate scientists have long warned that global warming will intensify storms, producing more of the kind of massive events that had occurred only once a century. Now, many of them are pointing to the recent nor’easters, as well as last summer’s series of destructive hurricanes, as evidence of their projections. Yet Steven C. Wofsy, a professor of atmospheric and environmental science at Harvard, cautioned that extreme events have long been part of the global weather system. “Since by their nature they occur infrequently, it is really difficult to say that they may be increasing or decreasing in response to climate warming,” he said.